While my feet were airing, I skipped rocks to amaze the children. One skipped across the river and shattered on a rock on the far side (there were a lot of brittle rocks there). By the time dinner was ready, all the kids had succeeded in skipping rocks somewhat consistently and had moved on to throwing big rocks in to make the best splashes. Dinner was made by soaking the dried food cold in the pot, and once it had rehydrated, warming it up. It seemed to take forever, but food always does when you're hungry. I think it was a successful experiment. We'd failed to get more denatured alcohol and were cooking over isopropal. Man that was smokey! But the soot wiped right off... We inhaled all the food, with no leftovers and nobody still hungry. Perfect. The kids played "predator and prey", which is hide and seek with animal noises. R has a terrifying growl that startled me every time.I took a little walk back to the bridge, since I'd been tuckered out and missed enjoying that section of trail. Several other people came down to our campsite and looked a little taken aback at how full it was. We told them all that we would figure out how to fit them in, but the other campsite is close and looked bigger and probably didn't have children. They all moved on and didn't come back. We learned later that the other site had 6 people in it by the end of the day. As it got dark, we tucked into bed. It started to sprinkle. When I woke up in the dark for a pit stop, I realized we have some learning to do about the tent. The lightweight fabric gets caught more easily in the zipper. That's a small problem, until it's wet and gets more caught. I ended up crawling out of the vestibule on my stomach and getting it unstuck from the outside. The rain (and perhaps just being new?) also made the tent floppy, so I tightened the ropes. 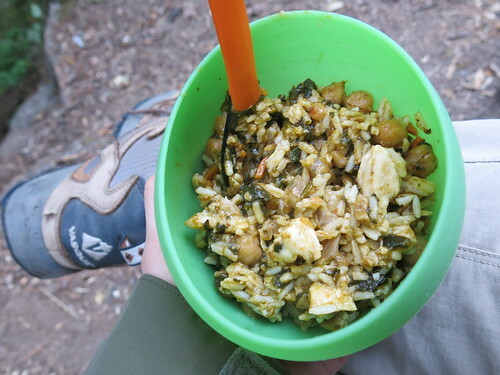 In the morning we had oatmeal in the rain. 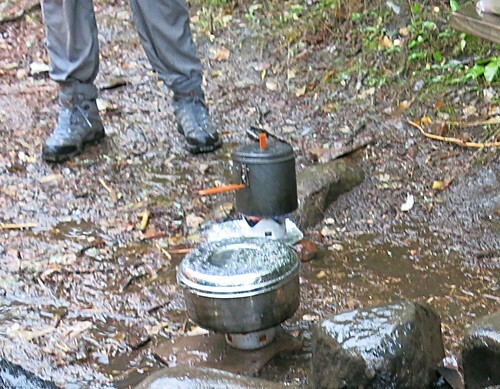 While the water was heating up, I made coffee sludge with dehydrated coffee and rain drops. That was not as effective as waiting for hot water, turns out. Boo wanted a sip, as she often does. But I usually pollute my coffee with sugar, and often milk. Not on the trail! Her "ewww" face was wonderful! Packing stuff up was a little awkward. 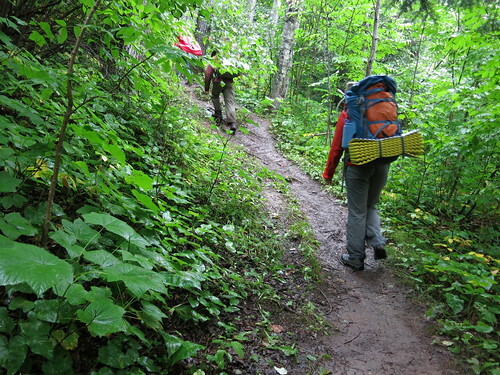 The rain had drizzled down the trail under the vestibule, so the belt to my pack was muddy. 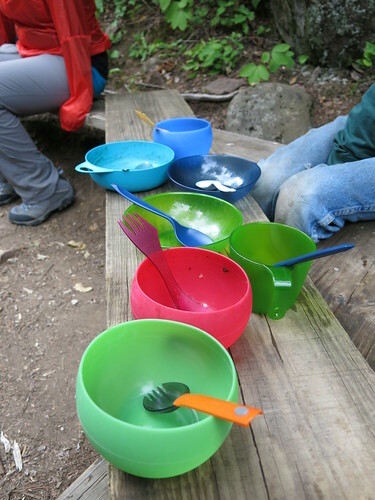 We got most everything that had been dry, into packs dry. 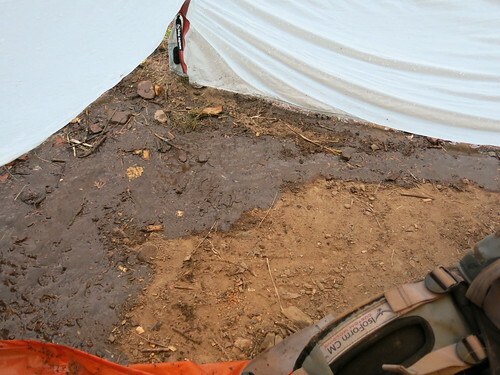 We did not add much mud to the tent in taking it down. With the one vestibule muddy, the doors of the tent were a little tricky. If I had a redo, I'd pack up from the vestibule that wasn't muddy! Packing was made a little easier by strapping the tent to the front of Lee's pack, under the compression straps, instead of trying to jam it inside. The fog was amazingly beautiful. Again, nothing I could get a picture of. The Devil Track River soon was just peeks and hints through the trees. There's some beautiful river down there, but don't bother bringing the big camera. The cliffs are also very pretty. The rain tapered off as we walked. I haven't been hiking much, or backpacking at all, for 2 years. Turns out I've lost the knack of properly snacking on the trail. I stopped to take pictures off a bridge, and .... bonked hard. Suddenly I could barely put one foot in front of the other. I hadn't snacked when the kids had, and I missed my warning signs. Lee saved me and stuffed food into me, as I was at the point I couldn't even figure out that food would help. Oops. Shortly after 11 (I think, I didn't have a timepiece with me), we reached the parking lot. Our ride wasn't there, as she was running a rescue shuttle for some folks who'd had gear failure in the rain (tent and rainjackets both). We ate lunch. The girls had peanut butter packets with bread or crackers. Those went well. The rest of us had tuna and crackers. The hike was very short (I think ~5 miles both days). But that was good for my level of walking with a pack, and it was the first time the girls carried full-sized packs (with room for sleeping bags). It was a lovely walk. The raspberries were wonderful. Pincushion Mountain is easy to get to, easy to summit, and very nice views. The river was beautiful. The rain wasn't unpleasant (though it could have stopped an hour earlier for drier breakfast...). Success.